Mechanical switches come in a variety of configurations. Generally they are expensive but rugged; this makes them highly useful as laboratory equipment, or any application where "rack and stack" is your preferred solution. One classic type of mechanical switch is the reed-type coax switch. 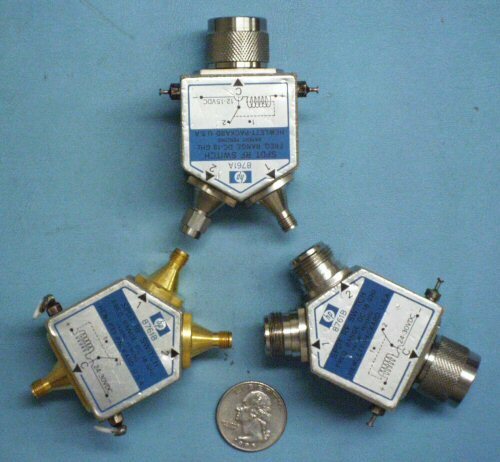 These switches pass signals down to DC, since the switching mechanism relies on mechanical contacts, and models are available up to 40 GHz with 2.92 mm connectors. You can order them with different relay set-ups, such as normally open, latching, with isolated ports terminated or unterminated, and with drive voltages from 5 volts to 28 volts. RF loss is exceptionally low (usually a few tenths of a dB), and power handling is high (more than 2 watts average, 10 watts peak typically). Isolation is always huge, from 60 dB to 100 dB. The drawbacks to this type of switch are their relatively large size, DC power dissipation, and slow switching speed (tens of milliseconds). They are used in thousands of miocrowave test benches to allow computer control of signal routing. 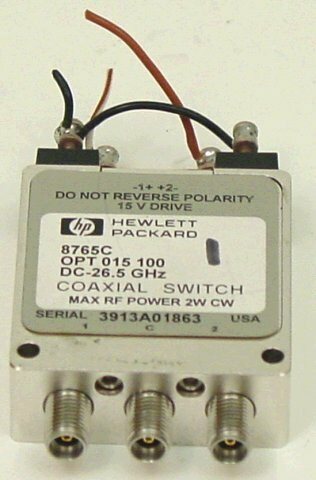 Below is an example SPDT switch made by Hewlett Packard, before they became Agilent. THe 8761 switch was used throughllut the industry up until more compact repoacements became available. You could get just about any connector on it, as the photo below shows. Bandwidth was DC to 18 GHz. Another switch you will find around well-equipped labs is the waveguide transfer switch. Here's a web site from a guy who built his own, it will show you the guts of this type of switch better than we ever could. The patience required to do this little project reminds us of the guy who cut off his arm with a Leatherman. 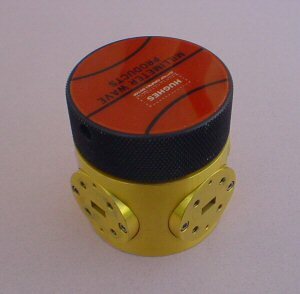 Expect 60 dB isolation and 0.1 dB loss over the full waveguide band. Hughes Electron Dynamics (sadly no longer with us) built the transfer switch shown below. This one is "powered" by your fingers; it is possible to buy such a switch with a motor drive if you can't afford an illegal immigrant to turn the knob.